A tiny tribute lives on in Belleville’s Quinte Mall, where one remaining store — a franchise purchased in 1979 — retains the Sam the Record Man name. As was Sniderman’s style, the store is dedicated to bolstering local acts. “Sam, first and foremost, supported Canadian artists,” Destun said of the hands-on businessman. Sam Sniderman and son Jason stand in the Yonge St. store in July 1999. Sam Sniderman was a man of many notes to many people. From patrons to musicians, each remembers the Toronto legend in a different way: a sharp business man; a selfless leg-up into the music industry; or an encyclopedia of all the latest and greatest. But everyone recalls him in exactly the same spot, standing on the sales floor — those creaky floorboards — of his three-storey, 40,000-square-foot Yonge St. music mecca, selling records and making recommendations. O’Connell first met Sniderman as a patron of the original record store on College St., a school-aged boy in the early 1950s. When Sniderman graduated to his Yonge St. location in 1961, O’Connell followed with his gang of friends. With their discount cards in hand, they — like so many other local youth and tourists — made the regular pilgrimage on Boxing Day, after school and on weekends to see what the record man had to offer. Sniderman passed away in his sleep on Sunday, his family announced early Monday morning. He was 92. Born in Toronto in 1920, Sniderman earned the Order of Canada in 1976 and was inducted into the Country Music Hall of Fame in 1997. Later in his teenage years, Page worked at a Sam’s in Richmond Hill’s Hillcrest Mall before the Ladies released their first five-song cassette, The Yellow Tape, in 1991. One of those tracks, Brian Wilson, opens with mention of a “late-night record shop,” which Page said is, of course, Sam’s. And once they’d made the tape, there was only one logical place to get the thing heard. “I called Sam the Record Man on Yonge St. and said: ‘Would you take some of these?’” Page said. When they hit the road early on to tour the country, Page said they were getting calls from Sam’s all over, asking to send more boxes of tapes. Now, after having millions of copies sell in stores around the world, Page knows one thing for sure. “Sam’s was frankly the best record store in the world,” he said. The empire the Record Man built is an exemplary tale of rising from nothing. It began the way most things do — with a girl. 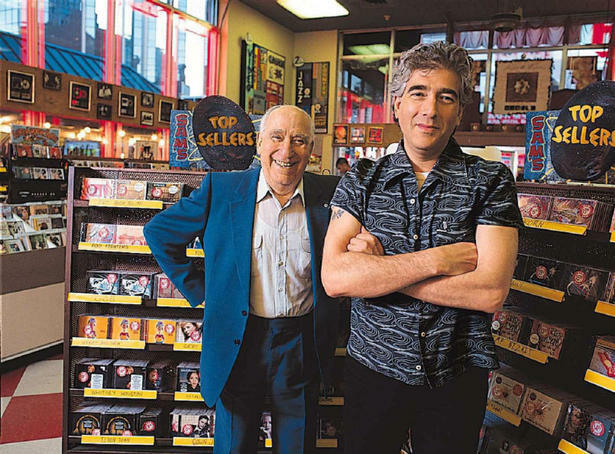 Sniderman first started stocking records at his brother Sid’s small store, Sniderman Radio Sales and Service, on College St. in 1937, to impress Eleanor Koldofsky, who would become his wife. But what started as a courting scheme turned in to a life-long love affair with records and the music they held. More than a decade later, the siblings would change the name to the now iconic brand Sam the Record Man, launching a chain of stores across the country. At its height in the late 1980s, Sniderman reported that the chain was an $80 million business, boasting 137 stores. “Sam’s was a three-storey Taj Mahal of records,” remembered Paul Myers, member of the now defunct Canadian indie band The Gravelberrys. Sam’s was the place Myers felt validated as a musician when the group’s album Bowl of Globes landed on the top-10 indie CDs wall at the store on Yonge, decorated with maple leafs under a Canadian flag. “We needed the boost in Canadian self-esteem that Sam readily gave,” he said. For many fans, most of whom never actually met the man who often held court in a private upstairs office, Sam’s is remembered as a first shot at a part-time job, or the place they bought The Beatles’ Abbey Road. As the music industry surged into the ’90s, so did Sam’s, stocking new formats, but never stingy on selection. But with the advent of Napster, iTunes and the digital music takeover, even giants like Sam’s couldn’t keep up. Though his family attributed the chain’s decline to family issues, not industry woes, Sniderman filed for bankruptcy protection in 2001. The following year, his two sons, Bobby and Jason, would resurrect the store and keep the doors open under the double-LP neon sign. But in the end, the Yonge St. property was sold to Ryerson University, and in June 2007, Sam’s played its last record. It was a sign of things to come. In the first quarter of that year, CD sales painted a despairing picture of the future for music retailers, falling an unprecedented 35 per cent compared with the same period in 2006. But Jeff Barber, of the local Sonic Boom music store chain, said a resurgence of vinyl in the past three years — something Sam’s missed out on — has buoyed retailers, staving off what seemed an inevitable death of physical music. That need is something Sniderman seemed to revel in. The Record Man would have cherished moments like Monday, when Canada’s music industry celebrated the best this country has to offer at the annual Polaris Music Prize gala. Polaris’ founder and executive director Steve Jordan said the night would be dedicated to Sniderman. “I think what people are feeling isn’t just the passing of Sam but the passing of that huge physical space with all of that music,” Jordan said. He recalled that the indie wall at Sam’s was always a great place to scope local talent, like Son, who is now better known as producer and artist Gonzales. He has worked on superstars Feist and Drake’s albums, which are both on this year’s Polaris short list. “Just that one opportunity he gave to that artist has grown into him having a hand in these two nominations tonight,” Jordan said. And while the final chapter in Sam’s history may now be closing, Sniderman always knew how to sell the story. “Dammit, at the end of the day I have to believe that what I did was really worthwhile,” he told the Star in 2001. Loyal patron Paul O’Connell offers testimony to that dedication. When his tastes switched from rock to classical music later in life, O’Connell said he was floored that Sniderman was right there on the floor to help, ready with new recommendations.